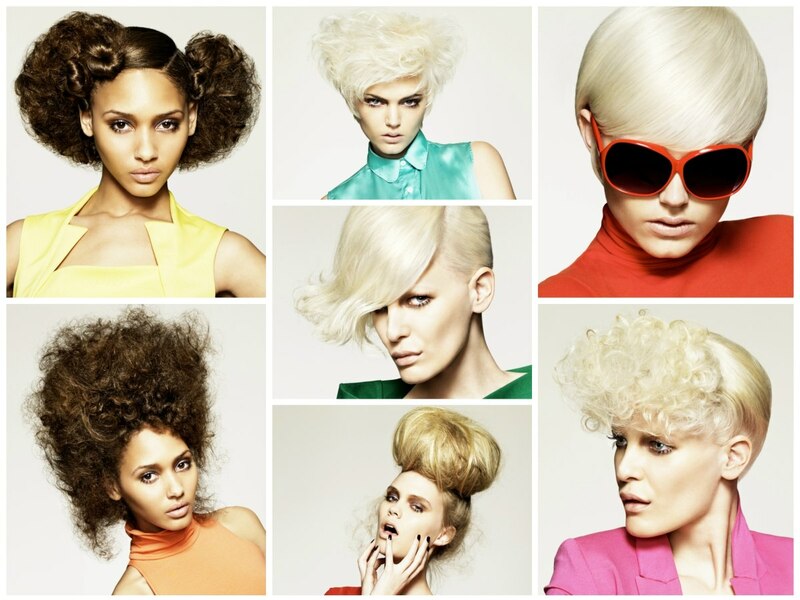 Pop Art, pop music and pop culture inspired this invigorating new hairstyles collection by Ishoka Hair Dressing & Beauty. Each and every one of the creative looks seems to ask "Where is the party?" Between channeling Andy Warhol and balancing a baroque updo extraordinaire is a rather ecclectic gang of highly stylish statements of drama and beauty. Bold, bright colors and powerful shapes come in a range of textures and lengths. Curls on the artistic palette just as incredibly smooth, satiny surfaces or wildly woven structures. A breath of fresh air and bright spark on planet hair! If Andy Warhol and Twiggy had a child it could look somehow like this. Simplicity in cut and color, but both executed with perfection. Each hair has its place and esthetic function. 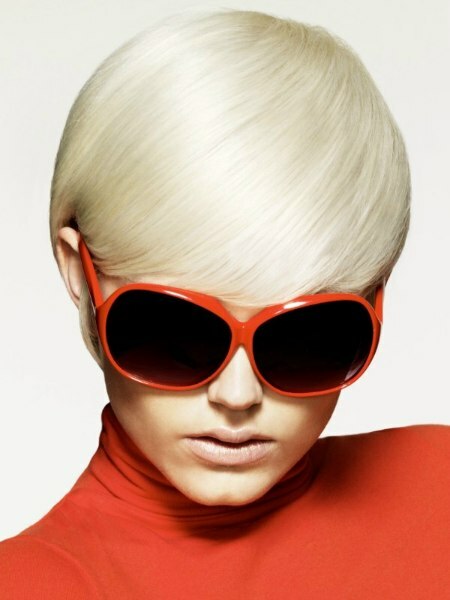 The platinum blonde hair color is bright enough to blind, so keep your shades on, everybody! Soft curving motion from the back towards the front and then around to the sides gives the short haircut a very fluid appearance. The styling is all about creating this satiny shine and liquid, effortless motion. The bangs are low and a darling special effect on the sides comes in the shape of two small strands resembling curious little sideburns. The high trapezoid shape seems like a natural choice for her face shape with all of the lines working together and turning into one single shape from her chin to the flat but high top. 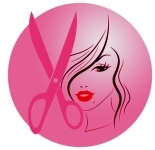 The haircut with its shorter sides and long top hair would deflate to a textured bob, but with enough air under its wings and of course a decent amount of product, it turns into a beautiful and eccentric style that seems to have come out of a fairy tale. 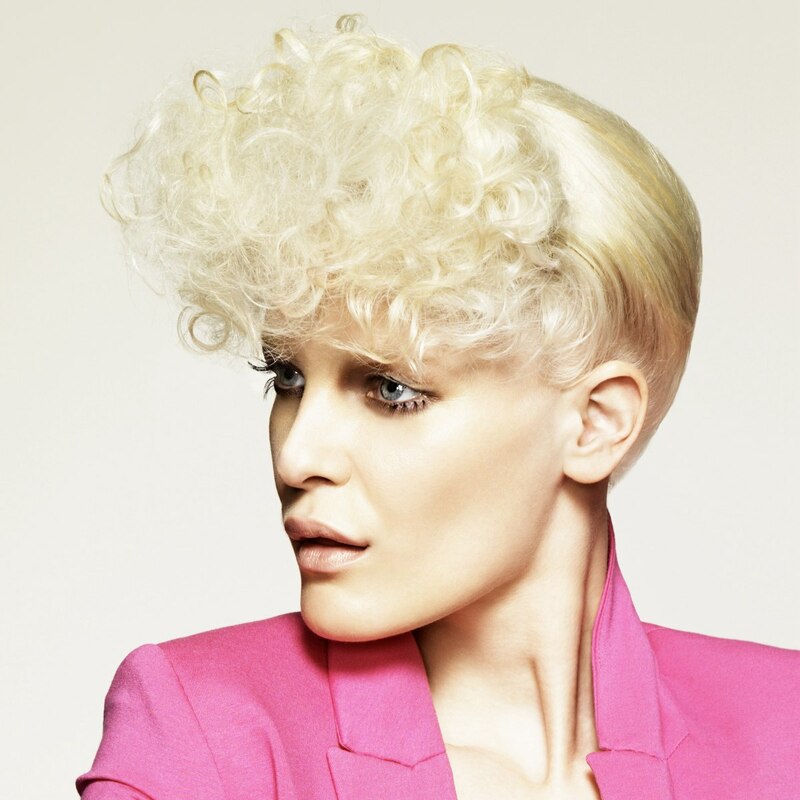 Swirling movement takes our breath away and the finest platinum blonde hair color is so bright and transparent, that we are not sure if it really is from this dimension. Reverse the traditional idea of having longer hair in the back and short bangs in front. Isn't this much more interesting?! The hair was sectioned into two parts from the temple on in a steep line to the back of her crown. The lower portion is styled in a tight fit to the back, while the front gets to play. To call this a fringe is a heavy understatement, so let's just call it the marvelous creation. With a buffed up volume in its top the hair flows forward and ends in fine, fun wispy waves that bring a lighthearted balance to the graphical serenity of the short hairstyle. A little excess keeps the spirit soaring every now and then. So get creative with your hair and take this exquisite short hairstyle as an inspiration. A contrast between strict and playful parts is so refreshing. The back section sits quietly in its peaceful, silken beauty, displaying the deep radiance of the platinum blonde hair color. The front explodes in a big quiff of angelic curls. Celebrate it with a wreath. This specific one was created out of her amazing walnut colored hair with its intense natural curl. It gives her a girlish but also very sophisticated appearance that looks polished and festive. The trick is to take some of the strands, two on the larger side of the side-part and one on the smaller side. These are twirled around themselves, which pulls the hair on her crown tight. Once fastened they are all that is needed to keep this look in shape. The curls were cut to fluff up to the rounded shape and won't flatten ever. A little shine spray adds a sparkly finish. The higher the better. A natural curl is indispensable to reach this lofty size and make it stay in place. The foot long volume starts at the base of her neck and while it reaches its height, it also widens slightly. The result is a breathtaking style with much historic inspiration, but a very modern texture. Part of the curls still show their defined shape while others are teased into fuzzy oblivion. Posh and a little pompous, but with extreme style factor once you learn how to balance this giant ball of hair. Of course there is a trick to it and your stylist might just know how to fill up the huge shape. Exaggeration is often the key to taking something from the ordinary to the extraordinary and to go from mundane to art. Each strand has its purpose, on top to break up the monotony of a round shape and all of the free flying fuzz around the sides is another way to challenge traditions and add a little happenstance an wildness to this elaborate updo.